Have your kids been begging you to take them surfing but you don't know where to start? Or are you visiting Cape May and have always wanted to learn to surf yourself? Leave it to EcoVentures! We offer beginner, novice and intermediate surfing lessons for kids and adults. 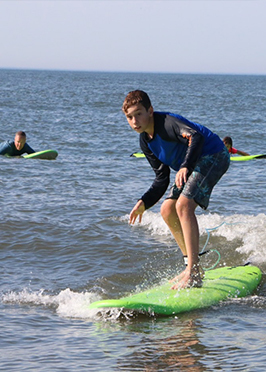 Surf lessons take place in Cape May and are held in a small group setting. The surf instructors at EcoVentures will spend personalized time with you or your child so they become comfortable and confident in the water. Besides learning about the basics of surfing, our CPR and First Aid Certified instructors will teach participants all about ocean safety including how to avoid rip currents, using the tides and waves to your advantage, and how to safely make it past the breaking waves. All EcoVentures surf lessons come with all of the surf equipment that you'll need, including a soft foam surfboard, leash and wax. We offer surf lessons for kids and adults as well as private and group lessons. 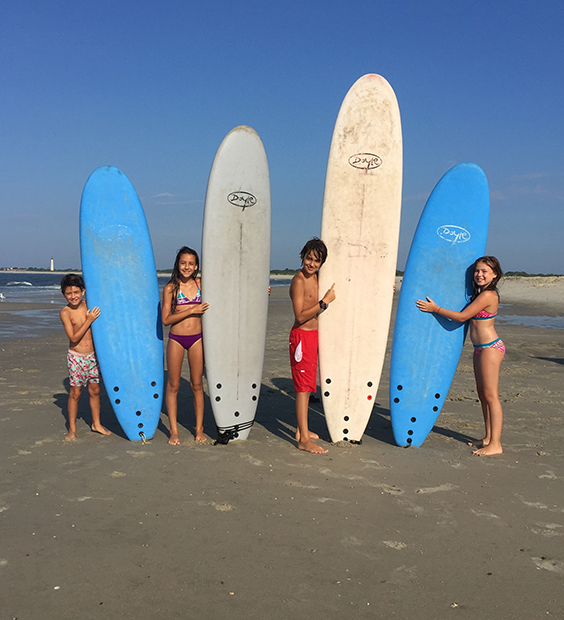 Surf lessons are available by appointment every Monday-Friday morning (some Saturdays also available) and take place on the beach in Cape May for your choice of 60 or 90 minutes at a time. We select beaches with gentle rolling waves and gradual shorelines so that all of our participants can learn at their own pace and comfort level. To reserve surf lessons for yourself or your group, call us at (609) 742-5656. Surf lesson spaces fill up VERY FAST, so be sure to book in advance of your trip! (609) 742-5656, or email us at info@EcoVenturesUS.com. * Do you need lessons for a family, corporate event or group? We can do that, too! Please contact us for more information. Group surf lessons are designed for ages 8 and up. Private lessons can accommodate ages 6 and up. All surf lessons meet directly at the beach. All surf lesson participants must know how to swim and be comfortable in the water. The ocean conditions vary each day, and it is important to be self sufficient in the water. You do not need to provide your own surfboard. EcoVentures will provide soft-top surfboards that provide excellent stability and protection when learning to surf. All of our surf instructors are CPR/First Aid Certified and are the same trusted staff that lead our daily marine biology programs held at The Grand Hotel. Parents do not have to stay but are more than welcome to. Children often feel more comfortable starting without an audience, but after 20 minutes or so in the water, have your camera ready! Bring water, a towel, camera and any snacks you may need. And don't forget a positive attitude and be ready to ride! Because our lessons take place in the mornings, participants do not need beach tags. * EcoVentures will also create a custom surf program for your group. Please contact us for more information. Cancellation Policy: A credit card is required to reserve your surf lesson date and time. Cancellations due to Mother Nature/Inclement Weather/Rough Surf Conditions will be rescheduled at the discretion of EcoVentures. If rescheduling is not possible, a refund will be provided. Cancellations made less than 24 hours of your reserved surf lesson, including no-shows, will not be refunded and will be charged the full amount of the lesson and rental. Cancellations made within 2 business days of your lesson will be charged a 20% processing fee. All other cancellations will be charged a 10% processing fee. Surf lesson registrations serve as your consent and agreement to this cancellation policy. Terms and Conditions: By registering for EcoVentures Surf Lessons, you hereby release, waive, discharge, and agree to indemnify and hold harmless EcoVentures, LLC, its partners, the cities where you take surf lessons, and subsidiaries (herein referred to as the 'released') from any and all liability, claims, demands, actions, and causes of action whatsoever arising out of or related to any loss, damage, or injury, that may be sustained by myself/my child, or to any property belonging to myself/my child, while participating in such activity, while in, on or upon any premises where the activities are being conducted, regardless of whether such loss is caused by the negligence of the released, or otherwise and regardless of whether such liability arises in tort, contract, strict liability, or otherwise, to the fullest extent allowed by law. I further hereby agree to indemnify and hold harmless the released from any loss, liability, damage, or costs, including court costs and attorneys' fees that the released may incur due to my participation in said activities, whether caused by negligence of the released or otherwise, to the fullest extent allowed by law. Additionally, I will not hold EcoVentures LLC or staff responsible for any injuries that occur as a result of first aid procedures or procedures I have consented to.